Steel Mart Offers Bow Shackles & Dee Shackles In Nut Bolt Type For Extra Safety. Capacity: 7, 12.5 and 18 metric tons. 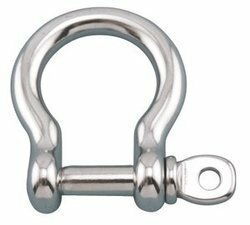 D Bow Shackle is narrower than a bow or anchor shackle and generally have a threaded pin or pin close. The smaller loop is designed to take high loads primarily in line. We offer screw pin type Bow shackles galvanized in various grades like grade 30, 40, 63 and 80.We have offer 1 ton to 80 tons bow shackles. Specification RR-C 271D, Type IVA, Grade A, Class 3. Safety factor = 6:1. This Bow Nut Bolt is made of premium-quality stainless steel, which makes it rust-resistant. 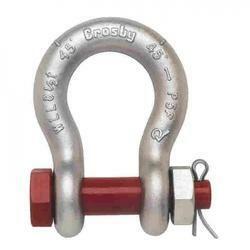 Best quality of D Shackle is offered by us to customers in bulk. One can avail this D Shackle from us at reasonable rates. This D Shackle is available in several designs as per the specific demands of our valuable customers. We provide customized packaging to our products at the time of delivery. Our company has created a niche in the field of offering Green Bow Shackle Screw Pin . We are supplier of Bow and Dee Shackles, in Nut Bolt Type For Extra Safety. All The Materials Are Offered As Per International Standards. We manufacture and supply a range G.I Bow Shackle that is assured to have high quality standards. These are appreciated by the clients for durability, exact dimensions, optimum finish and corrosion resistance. To meet the specific requirements of the clients, we also offer custom made g. I. Bow shackle in different sizes and with end fittings tailored precisely to fit desired application. Hightension Electrical Equipments Pvt. Ltd. Shape Type: O shaped or rounded. - We offer bow shackles that are O shaped or rounded.